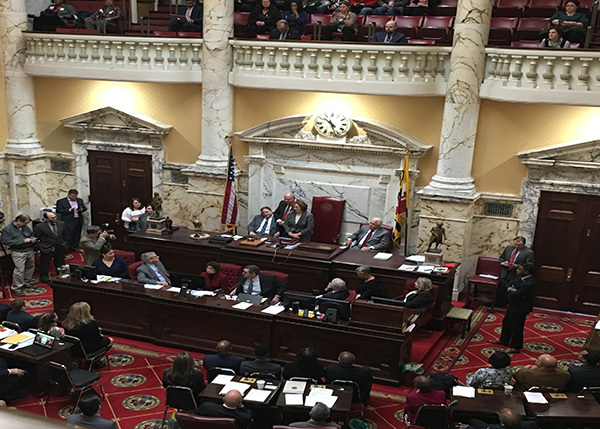 Thanking President Miller and the members of the Senate, Chief Judge Barbera stressed the award honors the efforts of everyone who works in Maryland’s courts. 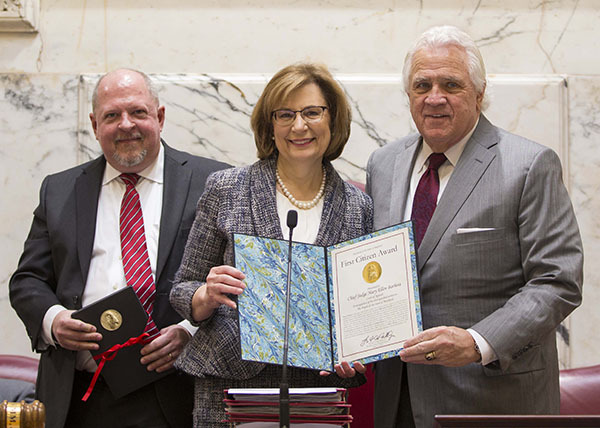 Timothy D. Baker, State Archivist, who presented the award on behalf of the Senate, noted that Chief Judge Barbera began her career in public service as a Baltimore city public school teacher who attended law school at night. “Her unique background and perspective have helped provide insight into the needs of underserved communities and individuals,” Baker said. After graduating from the University of Maryland School of Law, Chief Judge Barbera joined the Office of the Attorney General of Maryland in 1985 as an Assistant Attorney General in the Criminal Appeals Division and became Deputy Chief of the Division in 1989. In January 1998, she joined Governor Parris N. Glendening’s Office of Legal Counsel and Regulatory Affairs, serving as Deputy Legal Counsel until her promotion to Chief Legal Counsel in June 1999. 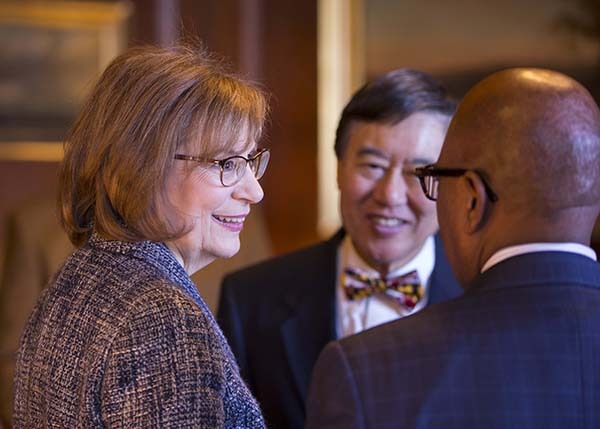 Chief Judge Barbera talks with fellow award recipients Dr. Wallace D. Loh, president, University of Maryland, and Dr. David Wilson, president, Morgan State University. In January 2002, she was appointed an Associate Judge of the Court of Special Appeals, a position she held until September 2008, when she was appointed to the Court of Appeals. 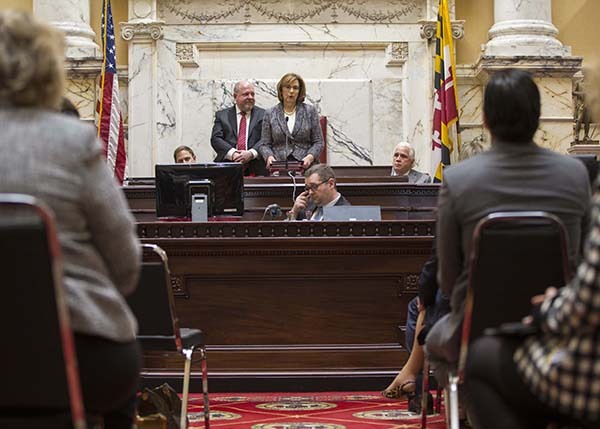 In July 2013, she was appointed Chief Judge of the Court of Appeals by Governor O’Malley, becoming the first woman in the more than 300-year history of the court to hold the position of Chief Judge. This is the first time in more than two decades that the First Citizen Award has been given to a member of the Maryland Judiciary. In 1996, it was presented to Robert C. Murphy and Robert F. Sweeney. Judge Murphy was Chief Judge of the Maryland Court of Special Appeals from 1967 to 1972 and Chief Judge of the Maryland Court of Appeals from 1972 to 1996. Judge Sweeney was the first Chief Judge of the District Court of Maryland, serving from 1971 to 1997. The First Citizen Award is named for Charles Carroll of Carrollton, who wrote a series of influential letters in 1773, three years before the start of the American Revolution, under the name “First Citizen.” In the letters, Carroll argued that government must work for the benefit of all and called for a radical restructuring of government based on the advice and consent of the people. Carroll was a signer of the Declaration of Independence, helped shape Maryland's first Constitution, and served in the State Senate, Continental Congress, and U.S. Senate.